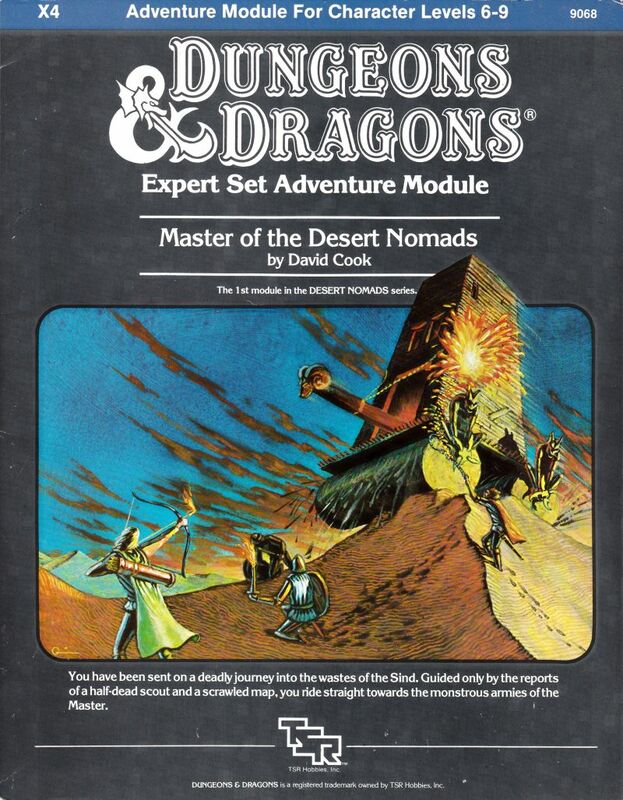 This week we're returning to adventure modules with a well-loved classic, David Cook's Module X4: Master of the Desert Nomads. This is actually the first half of a two-part adventure which is continued in module X5. There's also a sequel adventure, Red Arrow, Black Shield, which was written a couple of years later, albeit by a different author. it's a really terrible idea. Master of the Desert Nomads was published in 1983 and adheres pretty well to the formula of previous Expert level modules; wilderness adventure punctuated by a few dungeon crawls. In this case the wilderness is the Sind Desert, a massive wasteland west of the nations shown in the world map included in The Isle of Dread. A great army has been making its way through Sind intent on attacking Darokin (here simply referred to as the Republic) and the PCs are assumed to have answered the call for mercenaries to help fight. After reaching a village near the front lines, the party are charged to find the Temple of Death far to the west and destroy it. To reach the Temple of Death, the party first has to find the Great Pass; that's the focus of this module. The party must sail a raft up a river and through a swamp to reach the desert. There they have the option of joining a caravan to head west, or trying to go it alone. Eventually they should reach the monastery which guards the pass and will have to deal with the creatures which have taken over the monastery and masquerade as helpful monks to lure in travellers. 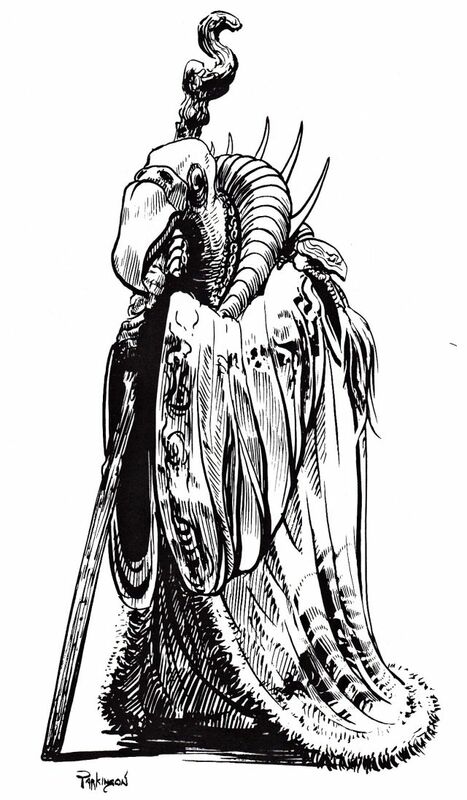 not a skeksis why would you even think that? Unlike in The Isle of Dread, where each wilderness encounter was keyed to a specific hex, the encounters in this module are to be used when the party is in the appropriate terrain without concern for their specific location. Given the size of the wilderness map provided, this is pretty much necessary. The party isn't expected to exhaustively explore the area, instead they have a destination to reach and are expected to be focused on that. Sind is a barren waste, but the adventure does imply that it was populated at some point in the past. Many monsters in the adventure are drawn from Hindu mythology such as the juggernaut, and the bhut (here a sort of were-undead that seems human during the day but sprouts fangs and claws at night and attempts to eat human flesh). The overall impression is that the culture that once existed here was based on that of India, but not a lot of detail is given. Eventually, nearly a decade later, Sind would be expanded on in the Champions of Mystara boxed set and established as being a current nation on the border of Darokin. For now though, we're not given any reason to believe that there's any civilization here. This adventure was the one that taught me more than anything about the dangers of railroading your party. As written, the adventure states that an NPC near the beginning will cast the quest spell on a PC to have them seek and destroy the Temple of Death. The player of the PC in question was a bit annoyed by that and was adamant that, while they would go on the quest, they would then come back, find the NPC, and beat him senseless. Seriously, unless your players are just being contrary they'll probably go on the adventure. If they won't, trying to force them will not make things any better. It'll just make them ornery. Next week we'll take a look a the second part of this adventure, Module X5: Temple of Death. We'll find out what's actually going on with the Master, explore the land of Hule and learn why it's not a nice place at all, and meet a few new monsters including what are bascially the Hounds of Tindalos by another name.